The paper speculates that the reason for the decline lies predominantly with last year’s disastrous Wagner Affair (Causa Wagner–background here) but that secondary reasons include the storm following the lifting of the excommunications from the four Lefebvrist Bishops last January. Dr Gerhard Wagner was an outspoken conservative Austrian priest whose appointment as an auxiliary bishop to the liberal but very polarised diocese of Linz caused total havoc in the diocese and in the wider Austrian Church. The local deans threatened to boycott his installation and, after several press conferences and public outcry (both in support of Fr Wagner and in opposition) he asked for the Pope to rescind his appointment. So what has this Wagner effect wrought? 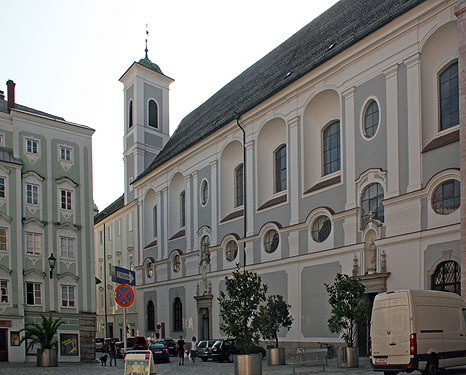 The number of people leaving the Church in the diocese of Linz was up by approximately 43 per cent from the year before. While this large sounding percentage actually consists of just short of a thousand people, it still marks a worrying trend for the Austrian church and which is mirrored to a lesser degree by the rest of the country. Fr Wagner was given the chance to address the issue in an interview with the OeberOesterreichische Nachrichten (OÖN). OÖN: Fr Wagner, why did the diocese of Linz experience the most people leaving the Church in decades last year? Wagner: It is a theme that can be seen in all Austria. In first instance, the people who leave are those for whom the connection(thread) to the Church is already very weak (thin). Wagner: One needs to see it in a larger context: There was that thing with the Society of St Pius X which didn’t suit some people. But one must not ignore the conflict within the Church. This chasm became also became clear with my appointment to the episcopate. OÖN: In this context the approach to your appointment has been criticised. Many parishes had the impression that the decisions were being made over their heads. Did the Church make mistakes? Wagner: No. I don’t know who says that decisions were made over people’s heads. Why should the procedure by wrong in my case but right in another person’s case? One has to say that for one thing there were people who were angry about my appointment and started spreading poison right away. Maybe somebody should ask even once, how turbulent the whole thing was for me. But every body knows that I have broad shoulders. This is all about power struggles within the Church. OÖN: Have these power struggles been set aside since you pulled out of the appointment? Wagner: What is clear is this: even if things seem quiet in the diocese, the problems are still far from solved. OÖN: Does that mean the diocese has to brace itself for another turbulent year? Wagner: It is to be exected. If I tell people something that they do not want to hear, then the danger they will leave the Church continues to exist. This is a development that I lament very much. But it is also not good when one is silent about all the difficult topics in the future because of a fear of statistics. I do not want the Church to communicate only deathlike silence. OÖN: Could it not also be that the Church no longer addresses enough contemporary topics? Wagner: If I say something that is no longer true tomorrow than it is already forgettable. The Word of God should serve to fire people up and to Das Wort Gottes sollte dazu dienen, die Menschen anzufeuern und zum Nachdenken encourage them to think. For this reason I hope that the bishops will also have the courage this year to say things clearly. Even in the knowleged that they might set off a number of things. OÖN: What are your wishes for a new auxiliary bishop? Wagner: I wish him courage and confidence.